Last week Princess Cruises announced that it was scheduling the Pacific Princess for a 14-night 50th Anniversary cruise from Los Angeles to the Mexican Riviera on December 3, 2015, fifty years to the day after the chartered Princess Patricia departed on her first voyage for the new line. In other news, last month Princess transferred its Japanese-built Diamond Princess and Sapphire Princess to UK flag, where along with three Australian-based P&O ships, they join a very small circle of five UK-flag ships in the Carnival fleet out of the thirty operated by Princess (17), P&O (10) and Cunard (3). Meanwhile, Adventure Canada will up its capacity by two-thirds next year with the charter of the larger Ocean Endeavour to replace Sea Adventurer in 2015. To celebrate its 50th anniversary next year, Princess Cruises has scheduled the 680-berth Pacific Princess for a special Mexican Riviera itinerary departing Los Angeles on December 3, 2015. 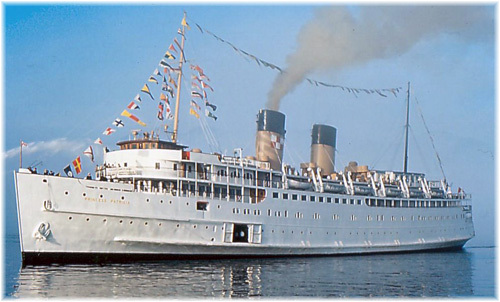 She will leave fifty years to the day after the line’s original ship, the 347-berth Princess Patricia, left on the line’s first cruise in 1965. 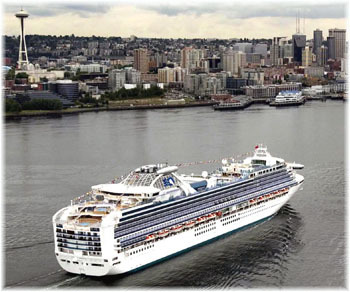 The original vessel, from which Princess Cruises took its name, was chartered from Canadian Pacific, who normally operated her in the Alaska cruise trade by summer and laid her up in Victoria each winter. It was Stan McDonald who saw this opportunity. 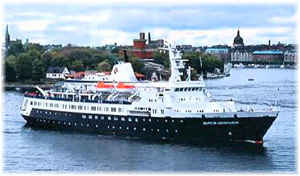 McDonald had got his start in cruising during the Seattle World’s Fair in 1962, when he chartered the 401-berth Miami-Nassau cruise ship Yarmouth for seventeen 10-day cruises between San Francisco and Victoria. From Victoria, passengers were ferried to Seattle in the Princess Marguerite, sister ship of the Princess Patricia. The name Princess Cruises had actually been used by Canadian Pacific for its Alaska service as early as the 1930s. As it happened, although schooled in Seattle, like the Princess name, Stan McDonald was also of Canadian origin. He located Princess Cruises’ first offices at 643 South Flower Street, at the corner of Wilshire Boulevard in Los Angeles, in the same building as the British-American Chamber of Commerce and not far from the Harbor Freeway. The Pacific Princess, which will perform the 50th anniversary cruise, is the smallest ship in the Princess fleet, and the 14-night cruise will be of the same duration as that first cruise on the Princess Patricia. It will include a blend of ports from the maiden itinerary, including Puerto Vallarta, Mazatlan and Manzanillo, and add some newer destinations such as La Paz and Loreto. During her two winter seasons with Princess, the 23-knot Princess Patricia turned at Acapulco and it was her success that allowed McDonald to move on to larger ships and expand into the Alaska trade as well. 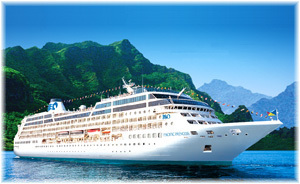 McDonald managed the fledgling cruise line from Los Angeles until 1974, when he sold out to P&O. The 50th anniversary cruise goes on sale on May 13, with fares starting at $1,699 per person, double occupancy. By way of comparison, fares on the 1965 Princess Patricia cruise began at $430. While that fare may seem high for 1965, they were less per day than her 8-night Alaska summer cruises, which started at $275. Guests on the commemorative cruise will also be treated to activities and entertainment celebrating half a century of cruising and will be joined by some surprise guests. Now one of the best-known names in cruising, Princess Cruises’ first season offered ten cruises to Mexico between December 3 and April 8 accommodating about 3,200 cruisers. Nearly fifty years later, Princess is the third largest cruise line in the world, with seventeen ships carrying 1.7 million cruisers to destinations around worldwide. Still on the subject of Princess Cruises, there are interesting changes of registry occurring there at the moment. After Princess, P&O and Cunard all abandoned the British flag for Bermuda, except for the three P&O Australia ships that still fly the UK flag, two Princess ships were transferred from Bermudian to British flag last month. This is not a return as the two ships in question had been registered in Bermuda since they were built in Japan ten years ago. On April 1, Princess moved its Diamond Princess and Sapphire Princess to UK flag and the ships now have London painted on their sterns instead of Hamilton. Princess has made no announcement but according to sources in Bermuda it may have something to do with the new trades the ships are shifting to in Singapore and the Far East as there may be some fiscal advantage to UK registry in Far East and Australian waters. At least, there is not the threat of the EU laws that apply when ships operate from the UK. On August 1, 2011, when the Equality Act was implemented, it was no longer lawful to pay differential rates of pay to other EU nationals, no matter where recruited. This meant that market rates of pay that had been negotiated for other nationals could no longer be paid under UK flag. The Act had misunderstood the competitive nature of shipping and how it works. Soon, there were no Cunard ships under UK flag, nor any P&O or Princess ships for that matter, except in Australia. According to The Transport Select Committee report on UK Shipping Strategy report of March 26, the number of UK ratings has fallen nearly 30% in the time since passage of the Equality Act, to the current level of 8,590, and a significant shortfall in UK trained seafarers is predicted by 2021. Of the two Princess ships that have been reflagged, the Diamond Princess also cruises from Australia during their summer season, bringing the UK-flag cruise ship fleet based in Australia to four on a seasonal basis. She is now cruising from Yokohama until November, when she shifts back to Sydney, remaining there until her return to Yokohama in April 2015. From next month through November, Sapphire Princess will be cruising from Shanghai, Tianjin and Singapore and from November she will be based in Singapore. 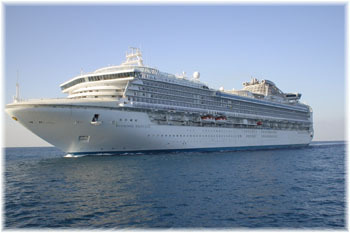 While on the subject of Bermuda, millions of cruise tickets have now been issued by Cunard, P&O and Princess showing their ships as “Bermudan.” The preferred usage in Bermuda is actually Bermudian, a term that generates ten times as many search results on Google, in excess of 9 million, compared to just 900,000 for Bermudan. 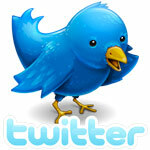 One cannot say that Bermudan is incorrect but it is not favoured in Bermuda, where Bermudian is regarded as proper. Toronto-based Adventure Canada announced a new ship last week when it revealed that it would be chartering the 12,907-ton Ocean Endeavour for its 2015 Arctic expedition season. The Ice Class 1B ship will replace the 4,376-ton Sea Adventurer. Outfitted with a fleet of twenty Zodiacs, advanced navigation equipment, several lounges and a ship-top observation room, Ocean Endeavour is perfect for intimate expeditions to remote environments around Newfoundland, Labrador, the Canadian Arctic, Greenland and the Northwest Passage. “Not only will we retain the entertaining and educational expedition programming our guests value, but we’ll be able to invite even more resource staff aboard to further enhance the experience,” said Cedar Swan, Adventure Canada’s vice president. Ocean Endeavour’s shallow draft and maneuverability allow her to navigate isolated fiords, sheltered bays and visit secluded communities to deliver the routes Adventure Canada is known for. While venturing to some of the world’s last great frontiers, such as the Northwest Passage, guests can appreciate the comforts of a boutique hotel and know their safety is first. 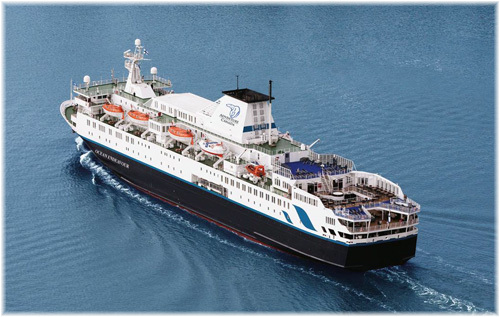 The Ocean Endeavour will comfortably accommodate a maximum of 198 passengers when in service with Adventure Canada. Compared to 118 on the Sea Adventurer this will allow two-thirds more passengers to enjoy these popular expedition voyages. Guests can select from a variety of cabin categories, ranging from 100 to 320 square feet, all en suite and with television. Built in 1982, the ice-strengthened Finnish-registered vessel was converted for cruising in 2010 and underwent further extensive renovations this year. Passengers enjoy spectacular views on several decks equipped with comfortable lounge chairs and can take advantage of amenities including sauna, Jacuzzi, gym and spa. Ocean Endeavour’s three lounges also provide spacious public spaces for simultaneous workshops, events and presentations, inviting each guest to tailor their own on board experience. Next story Are New Ships Offering Too Many Spending Opportunities?